In this day and age, the internet provides a venue to be heard and to influence other people's thinking. Any individual may raise his personal opinions on socio-political issues that interest him regardless of status or background. Everyone has unlimited access to whatever information that fascinates him. The internet allows the easy sharing and learning experiences from across the world. Social Media and Internet serves as an ever-changing arena for businesses to drum up attention for products/services and for those looking for opportunities to earn money. There are lots of posted endeavors that lead to full-time jobs and internet success stories. While the net opens up opportunities for most people, there are also downsides to engaging in online activities. It is important to know who you are dealing with and to remember that surfing the internet comes with certain inherent risks. Internet is easily accessible to anyone. You step into the public arena when you log on. Hence, it can be a dangerous place. With the glut of information on the internet, it is just a matter of time when cyber criminals, bullies, and corrupt businesses will try to take advantage of unsuspecting visitors. Unscrupulous persons may steal your site content and worse, your identity and misrepresent themselves. The online activities that give us unlimited freedom can compromise one's security. If we can't force content stealers and criminals to quit, what can we do to make them irrelevant? The technological advances come in spurs that makes legislation lag behind. When there are legal gaps in Philippine laws, how can ordinary citizens seek protection? 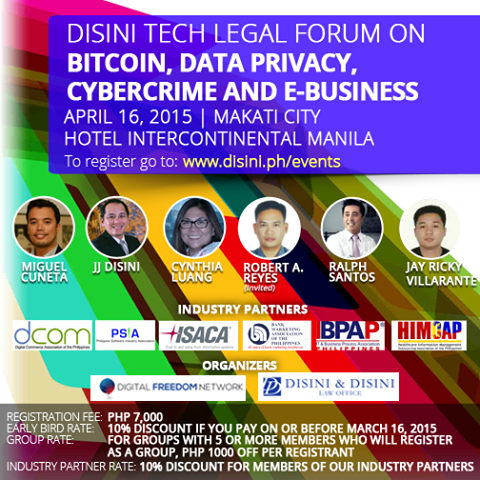 What laws have been passed on Cybercrime, E-Business regulations and Bitcoins? It now becomes imperative to raise awareness on proper internet use and encourage netizens to promote and adhere to online safety practices. The more prepared and informed people are, the better their chances in deterring untoward incidences. Informed internet users would can better manage their concerns on online security and protection. This is a helpful legal forum. Interesting forum. It is really important that we know how to protect and secure our privacy. Very interesting forum indeed. I never understood what Bitcoin is. Bitcoin is a digital currency needed for transacting on the Blockchain. Great forum indeed... I've heard of Bitcoin and used one when I need to pay someone in Fiverr.com. But, not sure if its just the same. 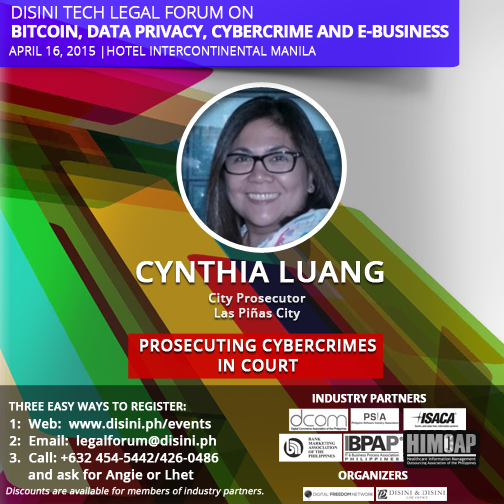 The topic is really very useful for all of us because cybercrime and other such issues are becoming more prevalent. I just wish the event doesn't cost so much. This is a relevant topic for bloggers, but I hope they can make the forum more affordable. A very helpful and informative forum. Cynthia Luang is my ninang :) Hehehe. This is a timely forum especially now that people are taking advantage of the Internet to perpetuate crimes. I'm sure this will be very informative and useful to us since being online is like second nature to us!